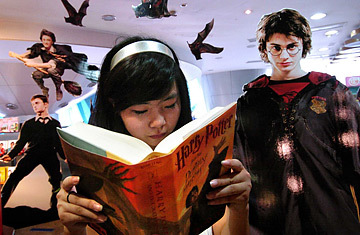 A girl reads a copy of "Harry Potter and the Deathly Hallows." Remus Lupin sat in the chair in the teacher's lounge closest to the coffee booth. He stirred his magically around with a finger, taking a long sigh in and a long sigh out. He knew that tomorrow he would start feeling ill again (since it was only three days from the full moon), and he really didn't feel like getting sick. He ran his fingers through his light brown hair and looked deep within the black, bitter coffee with a blank expression. The work of Harry Potter author J.K. Rowling will live on for generations to come. Only, those aren't Rowling's words. They're Candeh's, a writer on fanfiction.net who's penned three books based on Harry Potter. I couldn't get past the second book in the Potter series, so I can only imagine the melancholy of Potter fans everywhere as the seventh book closed the series. Perhaps Rowling's fans feel the same sense of loss that I did at the end of the HBO series The Sopranos. For many fans of ended sitcoms and long-ago cancelled TV series, the end doesn't necessarily mean the end (depending on the level of your obsession). There are 316,983 fan fiction works based on Harry Potter alone on Fanfiction.net. The current craze around consumer-generated media didn't start with Youtube, MySpace or even with blogging. Go back almost 600 years. In 1421, for example, John Lydgate, perhaps longing for just one more tale, wrote an obscure piece entitled The Siege of Thebes, a continuation of Chaucer's Canterbury Tales. The 1970s saw the dawn of fanzines, a pre-Internet form of user participation albeit distributed on mimeograph paper. Today fan fiction (or fanfic if you're in the know) is an Internet phenomenon where anybody with a computer and a connection creates and posts stories using existing fiction, television sitcoms, movies and their characters as the basis for their creations  much in the way that Lydgate continued the Canterbury Tales. True to the participatory web, many fan fiction sites provide visitors with popularity rankings and the ability to review fan fiction entries and sort based on those reviews. The combination of content-hungry fans, amateur writers with arguably too much time on their hands, and the Internet as the perfect distribution medium has led to this new Internet phenomenon. At Hitwise, we're tracking over 700 sites in our Entertainment/Books and Writing category, which includes author websites and writing and literary review sites. Fanfiction.net is the largest site in market share of visits, capturing 34.7% of the visits to the entire category. As of the week ending Aug. 25, 2007, the site ranked in the 159th position of over 1 million websites, putting Fanfiction.net ahead of sites such as Apple.com. Search engine data reveals the extent of Fan Fiction demand. With Harry Potter's terminus, Potter fans dominate the fan fiction category. Surprisingly, the second most searched for "fan fiction term" was for a fan fiction website devoted to the 1960s series Bonanza (Gunsmoke came in 4th). It seems that over half the columns that I've written for Science of Search at some point reference adult content. It's not me, it's just the data, and fan fiction is no exception. The third most popular fan fiction search term is for adult content. Of the 40,491 sites in our Adult category, the site with the highest percentage of female visitors (64.3%) is AdultFanfiction.net (proceed at your own risk). I ventured to Fanfiction.net to see if I could rekindle the spirit of The Sopranos. In the TV category I found several fan-created episodes for hundreds of television shows like: Laverne and Shirley (123), Dr. Who (7,779), JAG (3,409) but slim pickings for Sopranos (50). I can pick from episodes where Adriana is resurrected, selections where minor character Furio is fleshed out. I think I'll dive into something that sounds like Harry Potter meets the Sopranos, as one story promises, with zombies, angels and bloodsuckers. Maybe that's my problem with the Harry Potter series; the stories just need a few New Jersey wiseguys. Bill Tancer is general manager of global research at Hitwise.